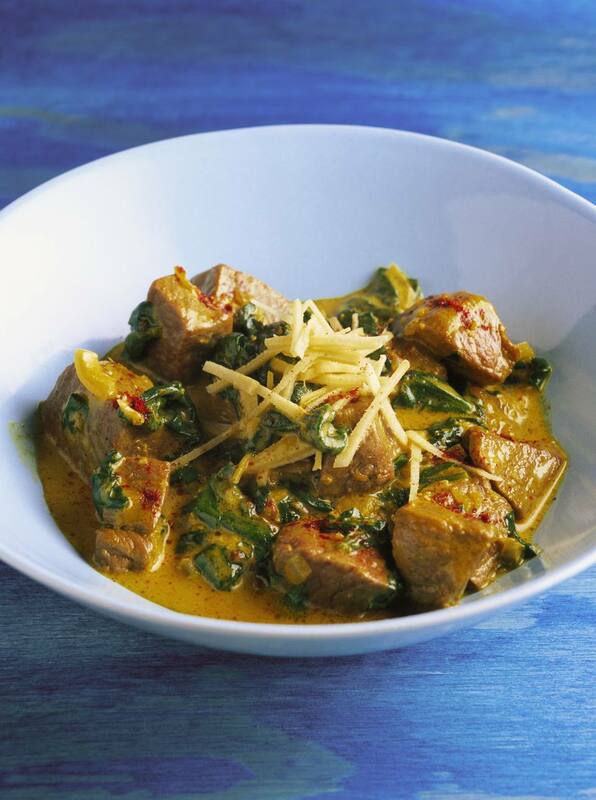 This lovely, lush curry is perfect for a hearty family meal. It would not normally be made with lamb shanks in India, as lamb is not commonly eaten—goat is more popular and is known (erroneously) as mutton! However, we love using lamb shanks—the resulting curry has a hearty and wholesome quality. While we will eat lamb shanks any time of year, we especially love them in winter! The spinach in this dish adds a delicious, earthy texture to it and packs a powerful, nutritious punch! Lamb shanks with spinach/gosht saagwala taste great with hot chapatis, parathas, plain rice, jeera rice. Add a green salad and you're set! Mix the garlic and ginger pastes, green chilli masala together in a large deep bowl until they are well blended. Add the lamb shanks and mix till they are coated well with the mixture. Cover with cling wrap and refrigerate for 2 to 3 hours. While the lamb shanks are marinating, wash the spinach well and chop. Put into a pot with half a cup of water and salt to taste and boil till wilted/ cooked. When the lamb shanks are done marinating, heat 3 tbsp. of the cooking oil in a deep pot/ pan on medium heat. Add the marinated lamb shanks and fry them until brown. Remove and keep aside. Add the rest of the cooking oil to the pot/ pan and heat. Now add the whole spices and sauté. As the spices turn slightly darker, add the onion and fry till they are pale golden in color. Add the spinach and the previously browned lamb shanks to this masala, mix well and add half a cup of water. Cover the pot/ pan and simmer the heat. Cook till the lamb shanks are tender. This will take approximately 1 to 1.5 hours and will result in a lovely, thick gravy. Remove from the fire and garnish with a dollop of fresh butter. Serve with hot chapatis, parathas, plain rice or jeera rice!